10/100Base Single Fiber Fast Media Converter can convert Optical-Electric Ethernet signals between 10/100M UTP interface (TX) and 100M optical fiber interface (FX). It could extend traditional 10/100M Fast Ethernet to the distance of 80km through single optical fiber link. 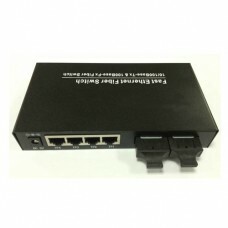 Its performance is stable and reliable, in line with the Ethernet design standards, and has anti-lightning protective measures. It must be used in couples. It is the campus broadband network, broadcasting network and intelligent broadband residential broadband fiber-to-floor fiber to the home of the best applications.